← Something’s wrong with Spike! Spike’s got his energy and can-do spirit back. He barks and hops and fake-growls at me until I grab the black suits and leashes. “Spike! We already went on a long hike this morning!” He insists. I guess he wants to catch up on what he missed on his sick day. Bridget and I follow Spike’s lead. He takes off like we’re on an expedition, holding his nose high and trotting along with great confidence and purpose. The three of us explore the rocks, ridges and ravines. Itty-bitty flowers of purple, yellow, and white look like miniature replicas of full-size flowers sold in garden shops. It’s a time like this that I wish my camera had a more powerful lens. I step carefully to avoid crushing the flowers. I notice Bridget’s habit of stepping daintily serves her well in the rocky desert. Blades of grass are sprouting all over. Grass? In the desert? I never would have thought I’d see so much grass. Stopping to rest, I’m reminded of childhood days of long ago. Many hours at a time I roamed the woods and fields around our house in northern New York State. Usually I fantasized I was an explorer or pioneer, living by my wits, reading animal tracks, fording streams, looking for signs of hostile Indians, (I read Last of the Mohicans several times. ), recording new plants, and so on. I remember building a hut out of pine boughs, packing the walls with the damp sod of the woods. For hours I sat inside peering out, not making a sound, waiting for a close-up look at wildlife. Of course, the landscape here in the Sonoran Desert is entirely different from the verdant valley in which I grew up. The anticipation of discoveries is the same. What's this? A giant squid in the desert? How peaceful to be standing in the desert with no one in sight, no evidence of human presence! What a gorgeous day! Some days I think about moving on, and then I change my mind. Why move just for the sake of moving? It’s warm and sunny here. The crew and I aren’t done exploring the land around our camp. I enjoy the gentle rhythm of each day, whether it’s washing the Casita or hanging out laundry or cooking with the door open wide behind me. Every evening I watch a new sunset. Shall I make a campfire, watch television, read a book, go online? When the weather improves elsewhere, I’ll go looking for elsewhere. For now I’ll keep enjoying now, here. This entry was posted in Simple living and tagged Ajo, Arizona, desert, fulltiming. Bookmark the permalink. I knew you were courageous, but I have never known anyone courageous enough to read Last of the Mohicans THREE times!!! Love it!! And I envy you the sunsets mostly. The West is gorgeous at that time of day. Oh, to be in your shoes,,, I wish, I dream, one day not soon enough…. I am glad Spike is back to normal. 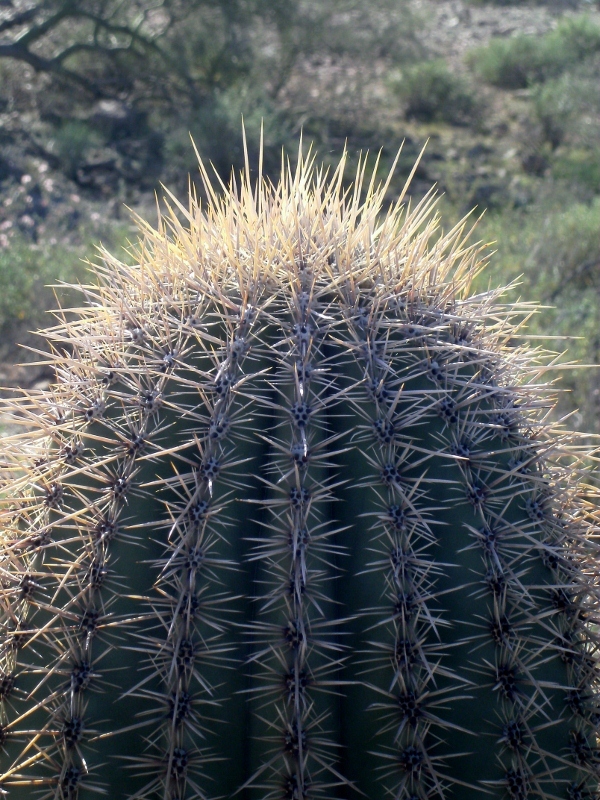 Your giant desert squid is actually a dead Ocotillo plant. Watch the living Ocotillo after it rains, they have the loveliest red blooms and bright green leaves. Glad Spike is feeling up to par today. It’s kibble or nothing. I run a tight Casita. So glad to hear that spike is doing well. Don’t you wish he could talk and tell you what is wrong?You make it all sound so enticing, we can hardly wait to get out there and start exploring. Oh boy, nothing like a walk in the desert to lift the spirits. All around discoveries, large and small, alive or dead. Enjoy the Now. I was checking all day to see that Spike is ok. Glad for the good news. Thank you for your concern! He’s doing fine now. I am so glad I stumbled on your blog. Have really been enjoying the posts. You have a gift with words, and photos too. After a teaser like todays post, am sure you would sell Kindle versions. I am quickly becoming a fan! And I am so glad you are enjoying my blog. I did, at one time, plan on becoming a writer. I think I was nine at the time. See Sue, Geri and I aren’t the only ones who think you are great writer!!! Glad Spike is back to normal. Miss ya’ kid! If wondering what to do while you are in the desert….WRITE A BOOK! It’s funny, as I was reading Sue’s latest post I was thinking the very same thing. Even putting all the entries in the blog into a book would be great. I look forward to the posts . . . it’s addictive! Glad to hear Spike is recovered. We all have an “off” day once in a while. The desert can provide some beautiful flowers after a rain. I hear the snakes are waking up early due to the warm weather. Nothing to panic about, just keep your eyes and ears open when you walk. They don’t want to meet you and the furkids either. I appreciate the warning, and your interest in Spike. It hasn’t rained in a while so when it does, I’ll be anxious to see what new blooms appear. Spring in February . .. nice! I enjoy your blog, especially comments about the dogs. We have a young kitten and are enjoying him just like a young child. Have fun with your camping, we have known Al and Kelly for a few years now and like kidding back and forth with Al. I wanted to be a follower but am not sure how to sign up for that. Hello, Wilf! Good to see your comment here. It’s been a while since I’ve had a kitten around. They are such fun to watch. To be a follower click on the box that says “Sign Me Up.” I assume there are instructions that pop up. I haven’t seen it as I don’t want to follow me! If you still have trouble, comment again and maybe another reader will help. Wanting to follow my blog is a nice compliment. Thank you! So glad that Spike is feeling better, Bridgette is happy and you are at peace with the world. As it should be! Keep on keepin’ on! Once again, you’ve made me quite envious. Glad to read that Spike is back to being top dog. Thanks, Page. Spike is back! thought processing to do each day where you are; sleep, nap, walk, eat, sunrise, sunset, take a pic, pet the pups: Man, thatz a lot of cojutating there!!! Enuff, my head aches!! Hug the pupz! This sounds crazy, but sometimes I feel like there aren’t enough hours in the day for all I want to do . . . and I haven’t left the campsite in days! No hosts around checking on us yet . . .
Aww Sue…so great to hear Spike is himself again! Had to run our baby almost 400 miles round trip to see our vet…yeast ear infection and an intestinal bug! Hate it when they are feeling poorly, thats when I wish they could talk!!! Oh, that must have been quite a day. I’m sure the trip was worth it. If you want to live like I do, it’s never too early to start planning and working toward that goal. Good luck. Glad you are still enjoying the blog. Thank you! I wonder if you would be tricked by a phainopepla (sp?) the way I was yesterday. I thought someone was whistling for their dog, and then I realized it was the bird making that sound! That sound most probably came from the boat tail grackle! They have an odd whistling call. When we first arrived in NM, it took me forever to figure it out. Finally, my boss Jake at Riverbend Hot Springs pointed one out to me and sure enough, in just a few minutes of watching, I saw him give that whistle! Hello Sue…I’m new to your blog and just introduced myself on the ‘rvsue’ section. As a Casita owner wannabe and a 60 something, I’ll be reading your blog every day from now on. You are such an inspiration! And you’re right…we all need to ‘enjoy NOW HERE’ wherever that may be. Hazel, I found your message. Good luck with your plans! Sue- I know that opinions vary but pet issues rank way up there on the ‘oh my God what do I do” now list. You remember our little visit with the local Vet with Holly. But what comes out of this generally is that you are going out live your kids (pets). I look at it this way. It’s enevitable that some day these precious bundles of joy go to pet heaven! Your priviledge is to care and enjoy them. Love ya kid and the blog…BR K and kids say HI! I didn’t know which Bill until you mentioned Holly! I know three Bills now. I just rolled onto Darby Wells Rd tonight to take a boondocking retreat from Tucson for a few days. Are you still out here? Millie and I will get out to explore tomorrow a bit. Sure is quiet and pretty here! It is beautiful here, isn’t it. Stop by my place and say hello! Even if you don’t have a powerful lens, you caught the sunlight back lighting the (Joshua?) tree. So glad Spike is back to himself. awesome pic of that sun set! Thanks, Francy. It came out kind of blurry which I like. Just wanted to let you know how much I enjoy your blog & your writing style. You’re in an area I SO want to spend some time at (The Bayfield Bunch’s blog makes my mouth water! ), but probably won’t get to again this year. We enjoyed reading of your NM stay…we have property south of Datil where we spent 2 months this fall, during the time you were bouncing between Elephant Butte, Percha Dam, & Caballo State Parks. We LOVE New Mexico! Aren’t Al’s photos absolutely stunning? I try not to go directly from his blog to mine because it makes me wince to see the difference. What a lovely part of the world to have property. It must be beautiful in the fall. Thanks for your kind words . . . If you’re going to stay put, I hear the Texas Hill Country is a good place to do that. Enjoy. No sense in spending gas money when you don’t have to. It looks like you are really in a great place. Glad to hear that spike is back to his old self. I figure the less money I spend on gas now, the more I’ll have for roaming around other places when the warmer months are here. But you knew that already . . .
Beautiful pictures Sue. Wish we were still exploring with you. And yes; you should write a book! A blog developed into a book. We are heading to meet our daughter at the coast this morning. Half Moon Bay State Park. Miss you. Samantha & Julie miss their playmates Spike and Bridget. We hiked past your old campsite the other day. I’d love it if you were still here. Enjoy your time with your daughter. I hope the weather is good. And thanks for the encouragement on my writing . . . I see that you build campfires. No restrictions given the dry area etc? I haven’t heard about any fire restrictions in this area. People have campfires in fire rings. With all the rocks and gravel between cactus and green plants, I guess the fire danger is low. Sue, I agree, stay put if you are still enjoying it. That is what it is all about. Glad to hear Spike is better, I had tears reading your previous post. I’m sorry I made you sad! Spike is back to his old, devilish, selfish, adorable ways. I’ve been stalking your blog for a couple of months now and thoroughly enjoy it! My perfect life would be my cabin in the summer and a boondockin’ RV’er in the desert in the winter! Your pictures are a beautiful antidote to the Alaskan weather and your writing is a pleasure to read. So glad to hear that Spike is doing OK!! Thank you for starting my morning with compliments. I hope you are moving toward your perfect life! It warms my heart to know there is another who roamed the great outdoors as a child, imagining wild adventures. I had private paths worn in the wooded hills of my childhood in S. OH…I read about Daniel Boone as well as Jim Bridger and all the men who explored the western mtns. I’m still plotting/planning my escape to fulltiming in my van. It was lovely to meet you in Quartzsite. Hopefully one day our paths will cross again when we have more time to visit one on one. You are such an inspiration. So glad to hear Spike is back! Have been reading your blog for a few months and you have the right idea to just enjoy the moment and keep it simple. Spring is around the corner and the desert bloom in April is spectacular if you have never seen it.